Cool Clarinet is a book that is aimed at the young beginner of the clarinet from their very first lesson to around grade 4 standard. The book includes fun pieces for children to play, in exciting modern styles. The music and technical information is clearly presented in the book and there is also listening games, puzzles and quizzes included in the book. The book is from the collection and series of repertoire books for pupils - all with great backing CDs, and corresponding books for the teacher that have the piano accompaniments to the pieces. 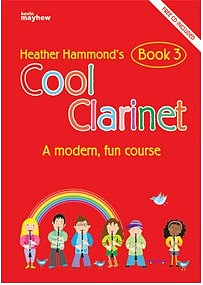 Cool Clarinet - Book 3 Student by Heather Hammond was published by Kevin Mayhew in January 1900 and is our 22713th best seller. The ISBN for Cool Clarinet - Book 3 Student is 9781848672895. Be the first to review Cool Clarinet - Book 3 Student! Got a question? No problem! Just click here to ask us about Cool Clarinet - Book 3 Student.